Aida White was among the volunteers serving food at the Brookline Senior Center when Congressman Joseph Kennedy III stopped by to help last Tuesday. BROOKLINE — Congressman Joseph Kennedy III, who doesn’t have any Republicans to tangle with to defend his seat in the 4th Congressional District next month, took to some community service by serving food during a visit to the Brookline Senior Center last Tuesday. The gourmet spread of fresh fruits and vegetables, baked goods, perishables, and other items was supplied by The Brookline Food Coop. 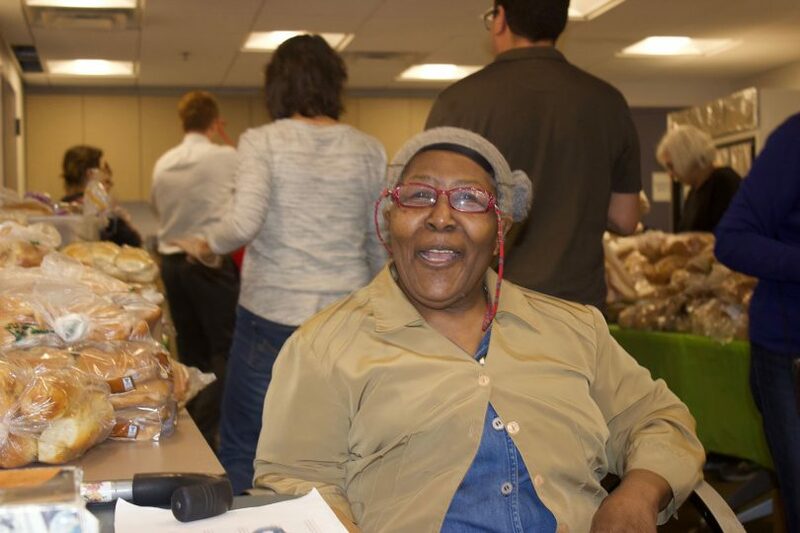 The co-op works with donors from more than 40 local restaurants, bakeries and grocery stores to distribute food items to more than 4,000 people each month at locations in Brookline and Boston’s surrounding neighborhoods. The senior center hosts the food bank from 2-4 on Tuesdays. For more information, visit brooklineseniorcenter.org/. To donate to the Brookline co-op, go to: brooklinefoodcoop.org/.